Since 1992, Terrell Lloyd has provided professional photography services to individuals and organizations throughout the United States. Based in the San Francisco Bay Area, near the high-tech capital of world, Silicon Valley, Terrell Lloyd is most known for his special combination of artistic vision and cutting-edge technology. Also for the past 10 years Terrell Lloyd is the athletic sports photographer for San Jose State University. Terrell has also earned a number championship rings for his work with the San Jose State University as well as the San Francisco 49ers for his work and services. Terrell Lloyd was selected in 2006 to 2010 to Canon USA prestigious program. Terrell was elected to their Canon Explorer of Light program. This is a group of top professional photographers from around the world selected to provide educational programs around the country. The Canon Explorers share their photographic and technical expertise to a wide number of photographers in a variety of personal appearances, seminars and gallery shows. 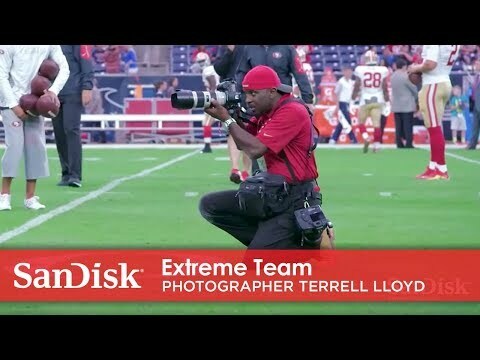 Also, SanDisk® choose Terrell Lloyd in 2009 to the newly formed Extreme Team. Also as a full-time photographer Terrell Lloyd is a popular speaker and travels around the country to speak to other professional photographers in places like New York, Florida, San Diego, and Los Angles and for regional Professional Photographers Associations. Shooting football has opened many doors for Terrell Lloyd and enabled him to cover other major sporting events such as PGA Golf, Professional Tennis, NFL Super Bowl, MLB Baseball, the NBA and more.